With men’s hoops and football both firmly in the rearview, we have dusted off the mailbag to answer your questions. Feel free to continue to send them over throughout the spring and summer as we will have frequent mailbags as we countdown towards the 2019 football season. 1. Does it look like there is competition at the QB position with the Cunninngham transfer? 2. Who you feel will step into the MBB lineup with Cabbill Graduating? We touched on this in our recent story on the progress of the offense during the spring and in our piece on the Cunningham transfer, this move leaves the QB room very inexperienced behind Buckshot. Of the 4 other quarterbacks on the roster at the end of spring practice, only North Dakota State transfer Henry Van Dellen has any playing experience as he got spot duty as a reserve in 4 games for the Bison in 2017. 3-star true freshman Johnathan Bennett is the odds on favorite to win the backup spot, and hopefully some of the other QBs will push him as he continues to develop. Losing Cabbil will be a tough pill to swallow. His presence in the locker room and on the court this past season was priceless as a leader, defensive stopper, and as someone who could create his own shot. It will take the entire team stepping up to absorb his loss. Elijah Cuffee will be the team’s go-to defender on the opponent’s top guard or wing scorer. I’ve mentioned this privately since the season ended, but I really think we could see Cuffee take a huge step forward over his final 2 seasons. He’s shown flashes of being a go-to scorer, and if he’s able to add that to his defensive presence, he could be an all-ASUN performer. To answer your question more directly, with Cabbil being the only starter not returning, the easy answer is Darius McGhee will slide in as a starter in the backcourt alongside Georgie Pacheco-Ortiz. I also wouldn’t be shocked to see McKay go a little bit bigger with either Kyle Rode or Myo Baxter-Bell moving into a starting role. One thing is for certain, McKay has plenty of options. Have other Liberty sports programs benefited in recruiting due to the increased success & subsequent national coverage of the football and basketball programs? If you look at the NACDA Learfield Directors’ Cup, it becomes obvious. This is an award given annually to the colleges with the most success in collegiate athletics. Points are awarded based on order of finish in NCAA sports. Stanford has won the Directors’ Cup each of the past 24 years. If you look at the top 10 final standings for as long as the award has existed, it’s a who’s-who of college athletics – Florida, UCLA, Ohio State, Notre Dame, USC, Texas, Michigan, Penn State, etc. The top 39 in the final standings of 2017-18 were all from Power 5 conferences while Liberty finished 126th. If the football program excels, it helps everyone. The same can be said for men’s basketball. It can also have an impact on academics and the general student body as well. Check out this article from the Washington Post if you want to dive deeper in how recent Final Four runs by mid-major programs (George Mason, VCU, Loyola) have brought insane amounts of revenue to the school as well as a huge uptick in student applications which helped increase the average GPA of applicants. Does Liberty ever have a chance of snagging high level Christian Athletes like Tim Tebow and Trevor Lawrence? Similar to the previous question, but the answer is yes. The more the football program grows, the better chance it has to snag players like the ones you have mentioned. When we were an FCS school, we couldn’t say that with a straight face. It may be a bit of a stretch now, but as we’ve seen in men’s basketball, we can be successful while recruiting athletes that fit the Liberty mold. It’s certainly much more difficult to do that in football when there are 85 scholarships on the roster compared to 13 in hoops, but we can always find some who want Liberty for what we stand for. The two you mentioned are all-time type talents though, how often do those come around? Will we ever get a NCAA D1 Ice Hockey program? Especially with our successful club hockey teams, it seems like the support and facilities are already available. This is a question we get pretty often in one form or another. The success of the men’s hockey program, both on the ice and in terms of fan support lends itself to wondering if we could see NCAA hockey at some point. For those unfamiliar, club level hockey is by far the most organized club sport on a national and regional level. The governing body, the ACHA (American Collegiate Hockey Association) maintains men’s Division 1, 2, and 3 levels, as well as women’s Division 1 and 2. There are currently 57 Division 1 teams, including Liberty. There are more than 200 Division 2 men’s teams, and around 140 Division 3 clubs. The ACHA Division 1 level features a very high level of play, with many schools providing financial assistance to its players. Nevertheless, it is still a step down from NCAA Division 1 hockey, which is quickly becoming a destination for top NHL prospects, something that wasn’t true 20 years ago. Liberty’s LaHaye Ice Center is a wonderful facility, and is among the very top rinks in the ACHA. It would be adequate as it sits for a lower tier NCAA Division 1 program. So the infrastructure exists, and certainly the university has the resources to invest should they choose to do so. NCAA D1 hockey generally features the highest budgets of any college sport behind FBS football. It would be a tremendously costly investment, and one would wonder if the return would be worthwhile. First, in all likelihood Liberty would need to move both the highly successful women’s program (back to back National Champs) as well as the men due to existing Title IX issues. So that basically doubles the cost right off the bat (could be worse than that due to the women needing to travel further for games). Second, Liberty gets great mileage out of ACHA hockey, and lots of big name schools are jumping on the bandwagon. The level of player choosing the ACHA level continues to improve, and brands such as Alabama, Arizona, and Oklahoma all field competitive Division 1 clubs. Every Liberty home game is broadcast under the school’s ESPN contract, the only such ACHA program in the nation to be able to say that. Conversations with folks around athletics and the hockey program both seem to yield the same answer. There is no interest to make such a large investment at this time. Perhaps one day it will make more sense, but the juice just isn’t worth the squeeze right now. The general consensus is that it’s worth riding the wave of growth and popularity that the ACHA is seeing for now. Men’s Lacrosse, another successful club program, is a MUCH more likely NCAA scenario. There are NCAA programs all around, as the sport is quite popular in the mid-Atlantic, so travel wouldn’t be crazy. It is also generally a much less expensive sport that is booming in popularity across the country. When will we be in the ACC? Liberty is in a perfect place right now with football being an Independent and all other sports in the ASUN. AD Ian McCaw and his staff have proven that scheduling can work as an Indy, and we’ve already secured a bowl tie-in. As the program continues to grow under new head coach Hugh Freeze, the sky is the limit. Coach Freeze has frequently mentioned that he thinks Liberty can develop into one of the best G5 programs in the FBS. 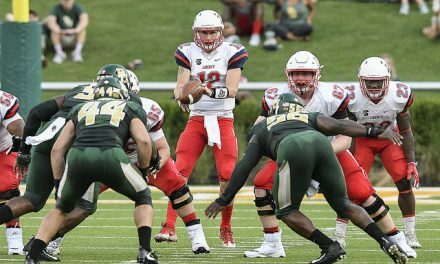 In the ASUN, Liberty has no pressure from conference administrators or peers about its football program not competing in the conference. 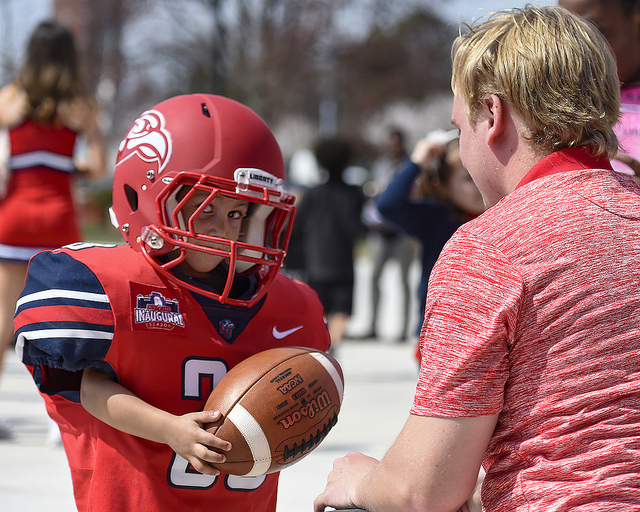 The ASUN also allows Liberty’s sports direct access to postseason appearances, and as the Flames have proven they can compete across the board. The ASUN has historically been very competitive nationally in all spring sports and has seen strong success in men’s and women’s basketball. There is plenty of room for growth in Liberty’s current conference set up and it looks to be the perfect place for the foreseeable future. Will the day come that Liberty outgrows the ASUN? We all certainly hope so, but for now just enjoy the growth. Are you more like the Red Sea or the Sea Of Galilee in terms of salt content? Funny story, when we were deciding on a new name a few years ago, the Red Sea was a popular choice. It was considered briefly, but then Sea of Red was proposed. We originally settled on Sea of Red, but SeaofRed.com was taken by a now defunct band. We reached out to them to attempt to purchase the domain, but, like most musicians, they thought much higher of the URL than we did. We’re happy with ASOR and hope you all are as well. Any cool surprises being planned within the new FOC? Should the floor at the new Liberty arena be named after Coach McKay or Coach Green? Simple solution: Carey Green Court and Ritchie McKay Arena. Which team (sport) has had the highest win percentage in school history? I can’t think of one better than the 1997-98 women’s basketball team. They finished the year 28-1, a winning percentage of 96.5%. Led by head coach Rick Reeves, the Lady Flames entered the NCAA Tournament undefeated before losing to 1-seed Tennessee in the first round. Any truth to the rumor that Bellarmine University is joining the A-Sun conference? This is the first time I’ve ever head this rumor. Bellarmine is a D2 school located in Louisville, Kentucky which sponsors 22 varsity level sports including men’s lacrosse at the Division I level and playing in the SOCON. They look like they would be a good addition to the league, but hopefully the ASUN can continue to attract other established DI Universities. High Point was rumored as a possible addition last summer when Liberty joined and maybe there is still some mutual interest there. They would be a great addition. Haha, no that’s not the case, and that was Alan York holding the mic. I was standing right next to him so it may have appeared that I was holding it. There are close to 100 uncommitted Division I grad transfers on the market and more being added every day, so for us to pick just one is like finding a needle in a haystack but we’ll play along. First of all, Liberty doesn’t have any scholarships available currently for next season, but we’ll just assume that one magically comes available. The biggest thing when it comes to grad transfers and McKay is fit. As he told us last year, “Grad transfers on the whole are a little bit of a risk especially if you have a healthy culture, which I think we do.” With that said, it’s impossible for us to be able to tell if a name on a list is a good fit for the team’s culture, so for the sake of the argument we will just assume our pick is a good fit. How about Akwasi Yeboah? He’s a 6’6″ wing from Stony Brook. He is originally from London, England and averaged 16.7 points and 7.7 rebounds for the Seawolves. Imagine him being inserted into the starting lineup alongside Caleb Homesley and Scottie James. Is Clifton Richardson Headed to Liberty As Well?